PA negotiator claims: Before we agreed to resume peace talks, the U.S. guaranteed us in writing that all our preconditions will be met. The Palestinian Authority (PA) agreed to resume peace talks with Israel without preconditions? Not according to chief negotiator Saeb Erekat. Erekat revealed, in an interview with the Nazareth-based Arabic language A-Shams radio station on Tuesday, that the PA would not have returned to the negotiating table with Israel had it not received a letter of assurances from the United States, guaranteeing its main negotiating preconditions. Erekat said in the interview that the U.S. had assured the PA in writing that talks would recognize the indefensible pre-1967 borders as the basis of a Palestinian state, would deal with all core issues (Jerusalem, refugees, borders, security and water), would take place within six to nine months and would not allow for any interim solutions before a final status agreement is signed. For years, PA Chairman Mahmoud Abbas imposed preconditions on talks with Israel, including a demand that Israel release terrorists who were jailed before 1993, freeze construction in Judea and Samaria (after refusing to come to the table when Israel froze construction in 2010) and even present a map of the future Palestinian state before any negotiations take place. Ahead of this round of talks, Israel agreed to a release of 104 terrorists, but rejected the other two preconditions. Israeli officials have claimed that Abbas had agreed to drop most of his preconditions before this round of talks began. Erekat also told the radio station that the European Union’s new guidelines which boycott Israeli entities operating beyond the Green Line were basically engineered by the EU as part of a deal reached with Europe so that the PA would resume negotiations. He said that the PA was currently talking with Latin American countries, China, Russia, Japan and the African Union to adopt similar sanctions toward Jewish communities in Judea and Samaria. Erekat admitted that in order to ensure Israel’s agreement to release 104 terrorists who were jailed before the Oslo Accords were signed in 1993, the PA had to commit not to unilaterally turn to the UN for recognition as a state during the negotiation period. He stressed that if Israel fails to release all 104 terrorists, the PA would be free to turn to the UN. Justice Minister Tzipi Livni recently said that the terrorists would be freed only if progress is made in the negotiations. If true, Erekat’s comments in the interview mark the first time since the talks restarted that any of the sides reveals the American guarantees it received in order to return to the negotiating table. 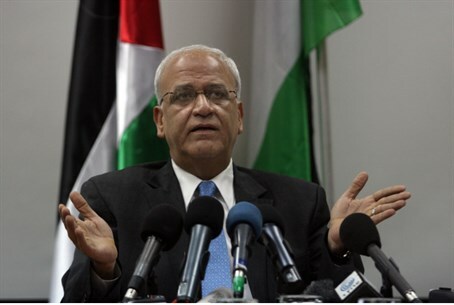 No Israeli officials have confirmed or denied Erekat's remarks. So far, details of the discussions between the sides have not been revealed, apparently consistent with a request from Washington last week for a strict news blackout. On Tuesday evening, the sides met at an undisclosed location in Jerusalem. The meeting was described as “serious”. The late evening meeting, which ended shortly before midnight, was the second meeting of the day between the sides. Earlier Tuesday, a senior PA official revealed to AFP on condition of anonymity that the negotiators met secretly in Jerusalem.